Organizations with fully automated time and attendance saw 67% greater year-over-year improvement in customer satisfaction, and half the increase in voluntary turnover than those organizations with no or partial automation. 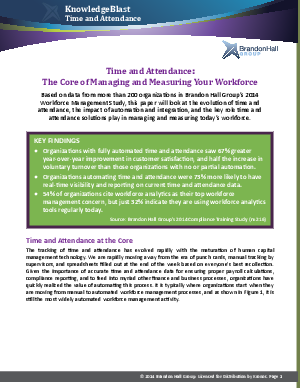 Organizations automating time and attendance were 73% more likely to have real-time visibility and reporting on current time and attendance data. 54% of organizations cite workforce analytics as their top workforce management concern, but just 32% indicate they are using workforce analytics tools regularly today.